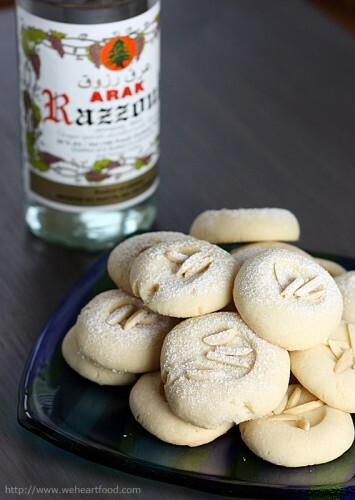 We had a Lebanese food fest at our friend Megan’s last night, and one of the items we brought were these delicious Arak cookies, adapted from a butter cookie recipe in Recipes and Remembrances from an Eastern Mediterranean Kitchen. The original uses orange flower water, but I thought they’d be delicious with the anise-flavor of arak. Boy was I right — the flavor level was right on: just a hint of licorice without it being overwhelming. I think they’re awesome — they’d be great with pistachios. These are delicious — and I don’t even like arak! Yeah, how’d you think to use arak in these? Genius! In a large bowl, use an electric mixer to beat the butter, sugar, and arak until the mixture is light and fluffy. With a wooden spoon, gradually mix in the flour. Preheat the oven to 325F. Pinch off walnut-sized pieces of dough and roll them into balls. Arrange the balls 2 inches apart on ungreased baking sheets. Gently press to flatten each ball to make round cookies about 1 1/2-inches in diameter and 1/2 inch thick. Sprinkle 3-4 almond slivers (or one pistachio) into the center of each. Bake the cookies at 325F 20 to 25 minutes or until they are firm to the touch. Don’t let them brown! Remove from the oven and let the cookies cool on the baking sheets 5 minutes; sprinkle with powdered sugar if desired, then transfer to wire racks to cool completely. This entry was posted on Sunday, June 8th, 2008 at 6:19 pm	and is filed under Desserts, Middle Eastern, Recipes and Remembrances. You can follow any responses to this entry through the RSS 2.0 feed. You can leave a response, or trackback from your own site. So simple and I love anise! These sound lovely! Wow, these are awesome!!! It’s funny cause it’s been days now that I’ve been wanting to use Arak (or Ouzo, same thing anways!) in a dessert… will definately have to try out these cookies!! Is 2 tbsp enough for the taste to come out? Marianna — The taste was definitely there, but no one was like, “whoa, there’s booze in these cookies!” Not overpowering. I’d *maybe* add another 1/2 tbsp or so next time, but then it might get to the point where those who don’t like licorice may not enjoy them. Also, our Arak is 100 proof, so maybe you could use that as a guide. it’s true, just the right amount of licorice flavour without dominating. maybe not enough for chris tho’– didn’t you have a glass of arak *with* your cookie? aha! I bet these are the ghraybeh cookies that Lebanese people go gaga over! I have yet to make them even though requested many times. Great idea to use arak!